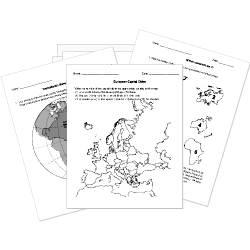 You can create printable tests and worksheets from these Grade 5 Australian Geography questions! Select one or more questions using the checkboxes above each question. Then click the add selected questions to a test button before moving to another page. Billabong is the Australian term for an oxbow lake. Australia is surrounded by the Indian Ocean. Australia is both the largest island and smallest continent. Which nearby island is considered part of Australia? Most of the population of Australia lives along the coasts. Australia's most populated state is Queensland. What name is used for the dry interior of Australia? The Great Barrier Reef , the world's largest coral reef, lies off the coast of Australia. Australia's Great Dividing Range is longer than the Himalaya Mountains. What is the only continent that is also a country? What is a country on the continent of Australia? What are the names of three of the six Australian mainland states?